Today we welcome the launch of the Lyon Declaration on Access to Information and Development, which was announced at the IFLA (International Federation of Library Associations and Institutions) World Library and Information Congress in Lyon. The declaration was drafted by IFLA along with its strategic partners and “calls upon United Nations Member States to make an international commitment through the post-2015 development agenda to ensure that everyone has access to, and is able to understand, use and share the information that is necessary to promote sustainable development and democratic societies.” The declaration emphasises the importance of access to information in empowering people throughout the world. IFLA are encouraging organisations and institutions who share the vision of the declaration to sign it to show their support, alongside the 134 information and library focused organisations from around the world that have already signed. The intention is to use it for advocacy purposes to influence the United Nations development policy framework to be launched at the end of 2015. The full declaration can be read here. This entry was posted in news, team blog posts and tagged access, information on August 18, 2014 by Gary. Justice Secretary Chris Grayling has announced changes to the punishment and reward system in prisons, stating that prisoners will no longer be allowed to receive books, magazines, birthday cards and other small items. Voices for the Library strongly oppose this decision. This move to view the prison system as wholly punitive in ethos rather than as serving also as rehabilitative and restorative is short-sighted and counter to the ethos of prison libraries and those who work in them. Access to books and reading is important for many reasons. It has been found to support people’s development by extending opportunities for social participation and contributing to the development of cognitive thinking skills. Caddick and Webster (1998) suggest that access to the communicated thoughts and experiences of a wide range of others through reading enables individuals to become more aware of the ways they interact with and make meaning of the world. It expands their ability to think about alternatives and evaluate their options, which may lead to strategies for avoiding criminal behaviour. They also state that a core part of developing a feeling of inclusion and identity with others, and feeling a responsibility towards others is literacy, through which people develop an ability to reflect on their experiences. Through education and access to reading, “Prisoners see themselves differently; they gain confidence and self-esteem. They talk about having hope for the future, often for the first time. They feel able to envisage a different future and develop new aspirations for themselves.” (Prisoners Education Trust 2008, p.2) The right to be sent reading material and other items is also a way for prisoners to feel less isolated and cut off from the outside world, to which the majority will return. Limiting access to books as part of a regime of incentives and earned privileges is counter-productive and more likely to reduce the likelihood that prisoners will respond to the scheme, which requires the reflective awareness that so often comes from reading. 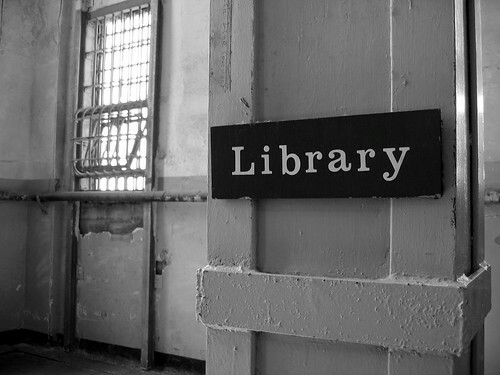 Every prison in England and Wales has a legal requirement to provide a library service for prisoners. They provide access to books and other reading materials and provide support for prisons’ Education Services and other projects, such as Storybook Mums and Storybook Dads, which are charities that work to encourage prisoners to build relationships with their children through storytelling. Although there are currently no suggestions that prisoners’ access to libraries will be removed, prisoners’ access to the library is extremely limited. Furthermore, most prison libraries are part of the public library service provided by local councils, and their book stock belongs to the library system. As we know, across England, libraries are being removed from the public. Funds are being cut, which has significantly affected the amount of new and up to date books which can be purchased. Branches are being made volunteer run and their stock is no longer part of the shared library system. Other libraries are closing and their stock is being sold off in bulk. These books are no longer available to anyone, including prisoners. It is therefore important for prisoners to still have the opportunity to receive books via other means. Access to information is a universal, human right, and removal of any means of access to information by the government suggests a lack of value placed by the government in this right. This entry was posted in statements and tagged government, human rights, information, prison libraries, Prisoners Education Trust, prisons on March 24, 2014 by Voices for the Library.